Game Nation Theme Park and Resort is proud to announce the release of their first ever hybrid graphic novel, GN Archives. But this is no ordinary tale. The original saga tells "true stories of fictitious events" yet to happen. 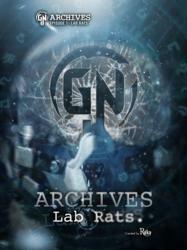 Episode 1, Lab Rats, the first in the series of historic hybrid novels, tells the legend of the evolution of Game Nation leading up to GN Celebration. Humans discover the possibility of other worlds worlds where games are real. Follow the first story as Wake discovers a universe of physics beyond his dreams and possibilities, beyond his imagination. Wake is excited to use his flight pilot training for something meaningful when hes recruited for a top secret, corporate-military joint project. Or he was, until co-workers began suddenly leaving the organization and strange lights started appearing on his flights. Track his journey as he uncovers plots in the organization he works for and tries to unravel the mystery of The Blur. But the revelation doesnt come until November at GN Celebration. Is this coincidence or truth to be uncovered? The Game Nation Archive series are not novels, nor are they graphic novels. They are a genuine hybrid tale connecting novel and comic book. The series is created and developed by RUKE and written by A.J. Scudiere, with art by Christopher Betancourt. This is the first of its kind, blending reality into fiction and offering real people the opportunity to be written into history as a Game Nation character. Written charactersas well as their human alter egos--will be celebrated at Game Nation Theme Parks and Events. This is a truly unique opportunity for those who join the army of Game Nation. Game Nation is giving fans the first look at GN Archives before the phenomenon hits. You're invited to join the GN Army and download your free digital copy at GameNationHacks.com and order your copy in limited release only at Amazon.com. Game Nations mission is to create a realistic experience that immerses the visitor into a story. By combining video game mechanics with interactive physical themed attractions, we are creating the worlds first Experiential Video Game Theme Park and Resort. Visitors will become players as they step into a re-creation of worlds based on popular video games filled with myths, legends and arenas. Instead of just rides, visitors are immersed in a world of total interactivity where, with everything they do, they earn a higher score, experience points and reputation. It is a place where dreams and fantasies will come to life. They will be able to become anything they like and live out the character they create in the actual park. But it's not a video game: its a physical, large-scale theme park and resort.